Jelf branch director Paul Chiffers, right, with regional director Kevin Hancock Paul Chiffers and Kevin Hancock, Jelf, Inverness. Financial services firm Jelf has re-jigged its top team in Westhill, near Aberdeen, and hired a new director for three branches in the Highlands and islands in a push to grow its business in the north and north-east. Graeme Cant is now leading a 60-strong team in Westhill, having joined the insurance broking, risk management and employee benefits consultancy just last year. He previously held senior roles with AON and PIB Insurance Brokers. Also in the new management line-up in Aberdeenshire is client services director Pam Mackintosh, formerly a team manager with Marsh & McLennan Companies (MMC) – Jelf’s parent – and Darren James, recently promoted to business development director. Jelf has also appointed Paul Chiffers as branch director of its Nairn, Inverness and Thurso offices. 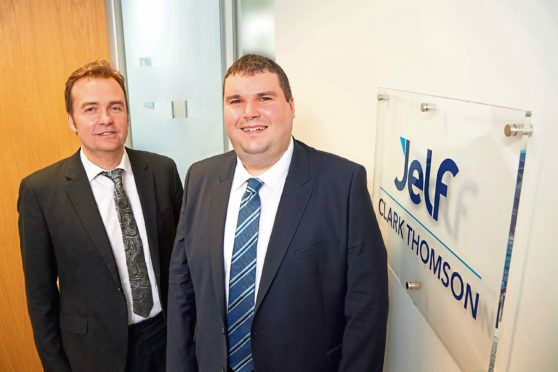 Jelf expanded north last year acquiring Clark Thomson Insurance Brokers, with offices in Perth, Dundee, Glasgow, Inverness, Kirkwall, Oban, Elgin, Thurso, and Nairn. Its Westhill operation – previously Central Insurance Services – was acquired by New York-based MMC in 2014.